This has got to be the best name for a soda. If I were a gay man, this is all I would drink. I'm not quite sure why, maybe I'm just being homophobic, but I would. If I lived out west. 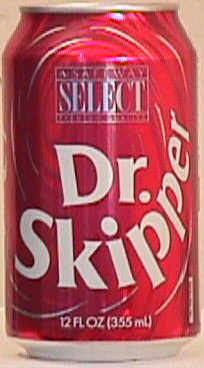 It doesn't smell as sweet as Dr P, it tastes more acidic than DP, and it's aftertaste is a little heinous. Not terrible, but not great. Brian thinks its worse than Dr. Radical, but I thought it was a little better. Without side-by-side comparisons this is all very subjective and worthless. I give it a 5.